Have you been enjoying your summer? Ours has been so much fun! Our boys are old enough now that we can take off on little adventures without worrying about bed times, melt downs, or diaper changes - yeah!! It looks like my little friend Milton mouse is enjoying his summer too! Nothing is more relaxing than reading a good book under a giant flower...or in my case in a nice hammock! This image is a darling Sweet 'n Sassy digi creation, called Milton Reading, and is available for download for only $3.00. Milton has been paired with some lovely Ruby Rock-it paper and ribbon from Papertreyink. The sentiment, Sweet Summer, is actually from a brand new Sweet 'n Sassy acrylic set, Feeling Fruity Cocoa. Enjoy! 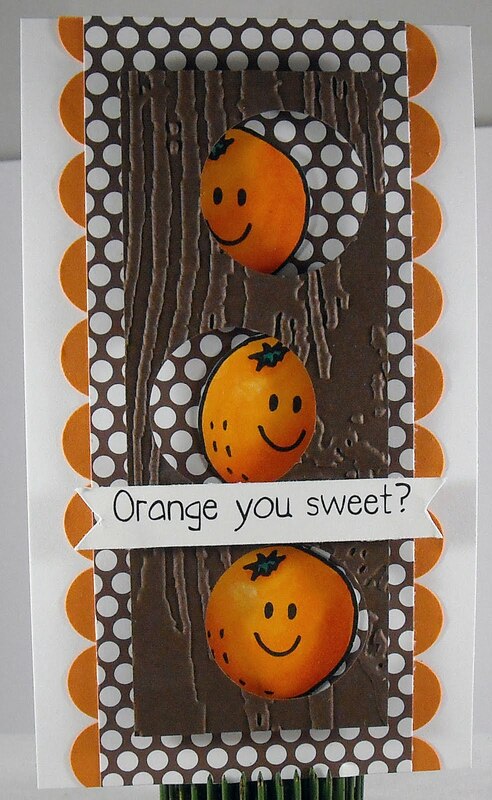 I've been thinking about making a card with this darling image ever since Korin sent it to us...This is a new digi image that has been released from Sweet 'n Sassy named Orange You Sweet and it's available for only .99! I printed out the image three times, colored my cutie oranges and cut them out. 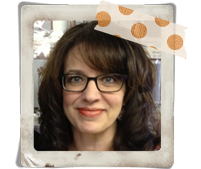 I then created a CAS card by simply adding a bit of color, texture, and polka dots.....one always needs polka dots! 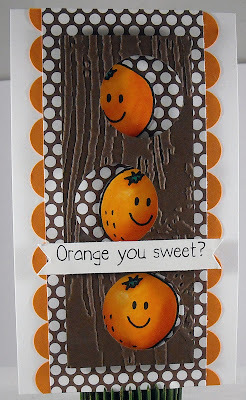 The brown piece of cardstock has been embossed and punched so that the wee oranges can peek through the holes. For dimension, I used foam tape to pop up the windows. I finished off the card with the sentiment, also included with the image. Super quick and easy! Enjoy! 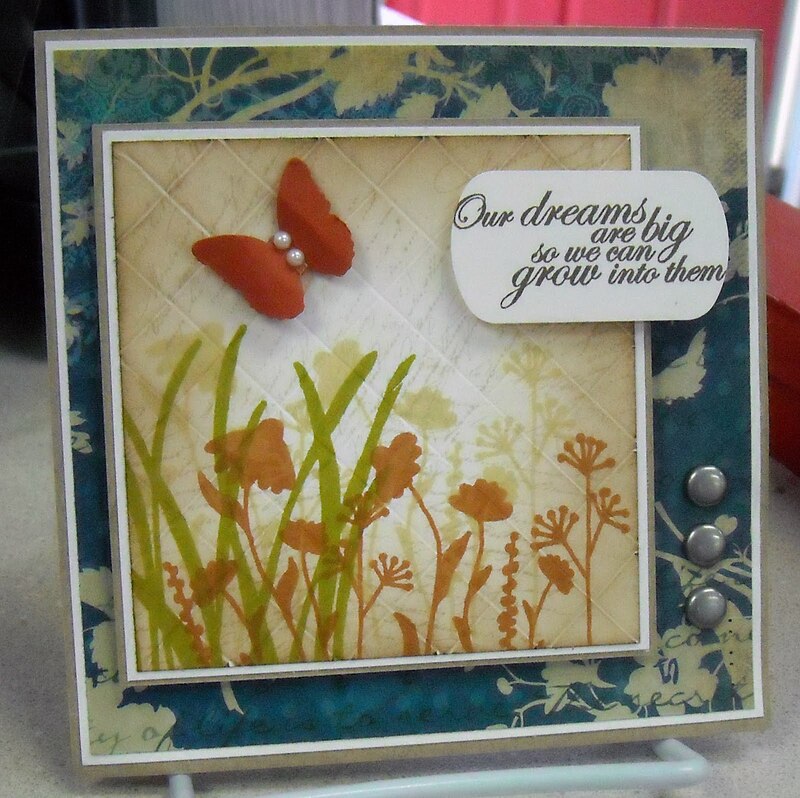 Today's Tip: Use silhouette images to create a quick and easy card! Are you guys tired of seeing this stamp set yet? I hope not because I love it!! It's a new release from Sweet 'n Sassy, Serene Silhouettes and I adore this set, love the versatility of a set like this...and keep checking back...there just might be more images like this on the horizon!! Now this card might not seem all that simple but it's really easy to create. 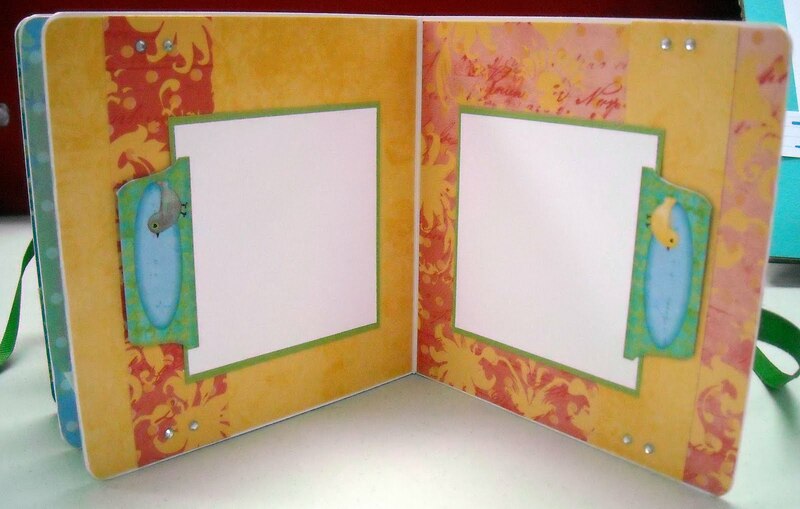 The first three layers are simply that, just cut pieces of cardstock and DP. The main image layer was created using a Scor-Pal to make the grid lines. I then added a bit of Distress Ink to help the lines stand out a bit more. All that was left to do was add my stamped images, in a variety of colors, a Maaaaartha punched butterfly, my sentiment, and a few brads! Easy peasy! Enjoy!! Greetings! First off, thank you so much to those who left comments earlier this week, it is greatly appreciated! I don't typically watch for comments but it's been so quiet lately that I was starting to wonder if folks were still reading. :-) So it was lovely to hear from some of you!! And now for today's project!! 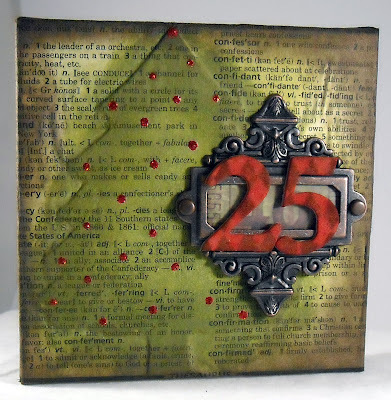 Two altered canvases, straight out of the Tim Holtz book of designing! 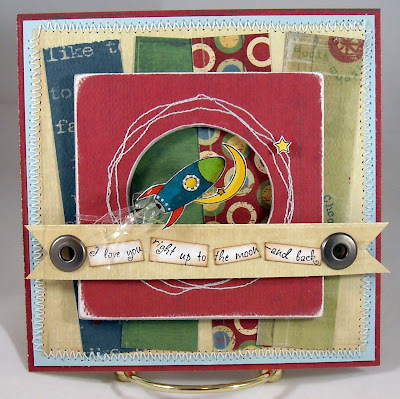 A few weeks ago Tim posted a sweet project on his blog, using a tiny canvas and grunge board shapes. This week was Christmas in July at the store, and once I saw Tim's project I realized it was a fantastic idea for a class! My canvases are 4" x 4" and both have been covered by dictionary paper (nothing like buying a dictionary just to rip pages out of it...I felt a bit guilty about that! LOL!) We used Matte Medium (think Modge Podge) to adhere the paper to the canvas. The paper is wrapped about the sides and back of the canvas, like you would wrap a package. The Joy canvas has been aged with Distress Inks, stamped on with a polka dot background stamp (from SU! ), and had a swirl added from a Tim stamp set (Urban Chic). The flower was cut out with one of the new Tim Sizzix die cuts. I cut up the largest flower (the die cuts out four flowers at once) to make leaves. 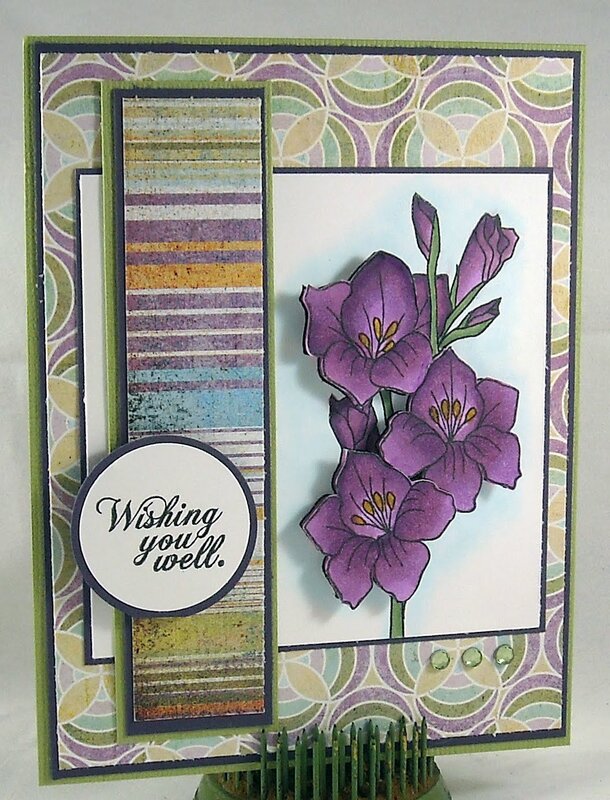 The flowers were cut from grunge paper and color was added with Distress Inks. Same process for the Joy letters, with the exception that the letters were pre-cut from grunge board. 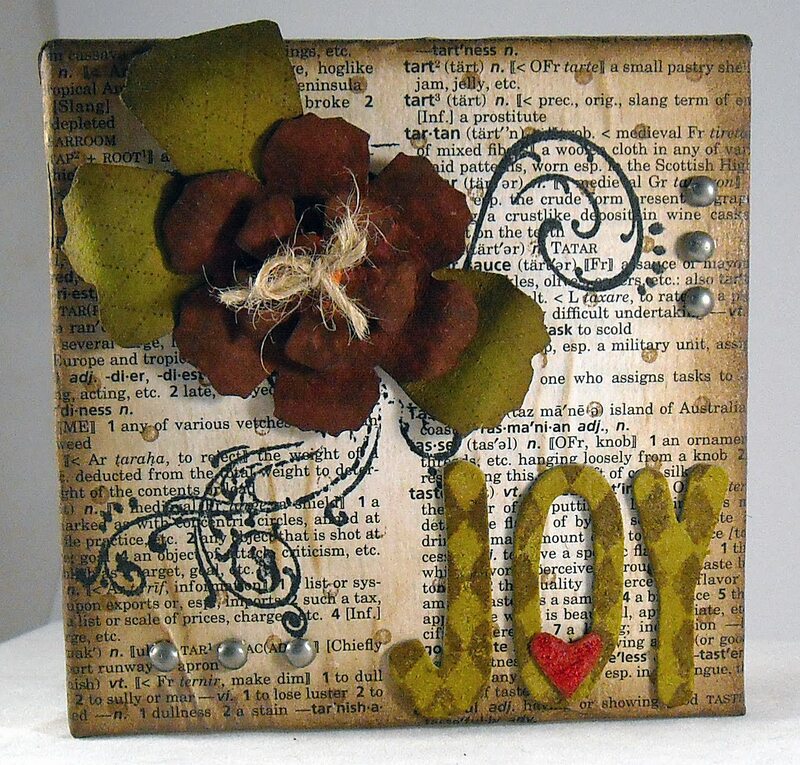 I also stamped decorative images on the flower, leaves, and letters. The flower was bended, etc. for some dimension (grunge paper is so much fun!!) and then I added a few brads as embellishments. (For the brads, since you can't attach them through the canvas, I cut off the little arms and used Glossy Accents to attach them to the canvas.) For the Christmas tree canvas, I used a Spellbinders die cut for the tree (cut out of grunge paper.) In class, we doubled the thickness of the tree, which worked better since grunge paper is thin. You would not need to do this if using grunge board. The tree was attached before adding the dictionary paper. I then used my fingers and a bone folder to gently push the paper down around the edges of the tree so it would pop out just a bit. I then used a blending tool and Distress Ink to ink over the edges of the tree, making it pop right off the page. Edges of the canvas were distressed with more ink. Then I added a big 'ol metal plate, also new from Tim's collection, and the number 25. Some red stickles finished off my tree decorations! (Someone at class suggested adding a small star to the top of the tree, great idea!!) 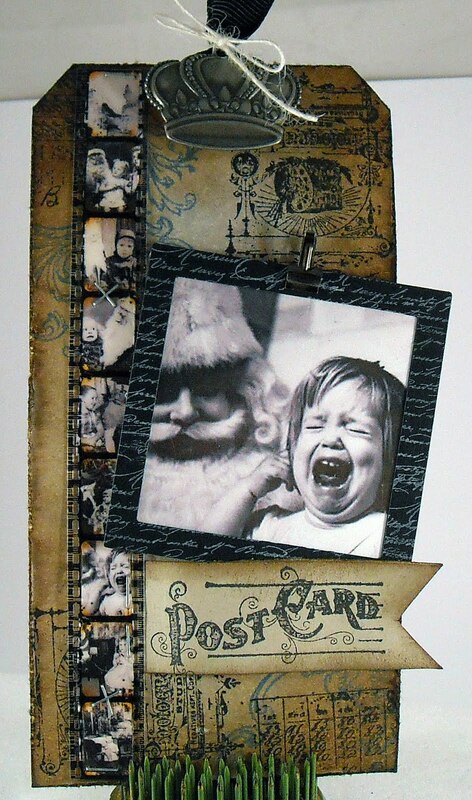 And there you have some fun altered canvases...I'm thinking these would be perfect on my mantle this year... Enjoy! SALT Challenge - A Trouble-Free Life? Tap, tap....is this thing on? 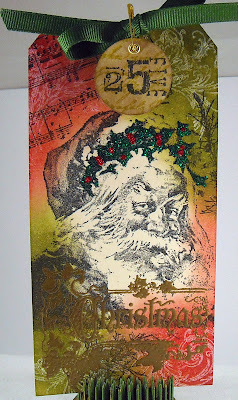 It's been painfully quiet here on the 'ol blog...from me and from those out there in blogland! I'm not one who worries much about comments but I have become a bit curious if folks are still reading...Anyone? Bueller? Well, it's been quiet from me too! I feel like we've been so busy lately...not with anything in particular, just enjoying the warm (or should I say hot) and long summer days. Even though I have a bizillion craft projects to complete, I'm finding it hard to get back into the studio. I want to just hang out on a beach somewhere and catch up on my reading! 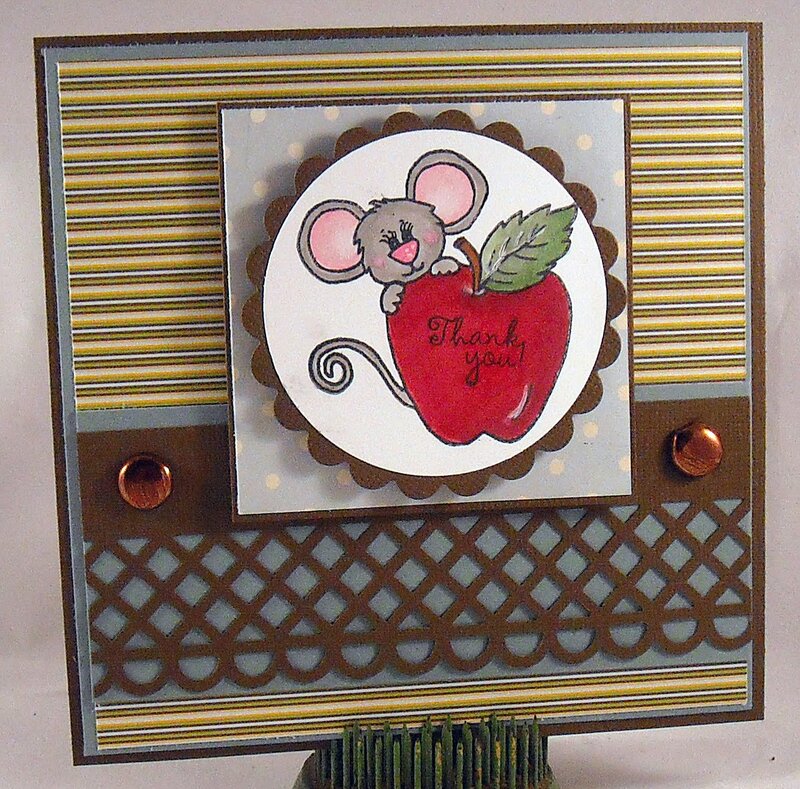 But...I did manage to sneak in last night to produce a card showcasing a brand new Sweet 'n Sassy stamp set! 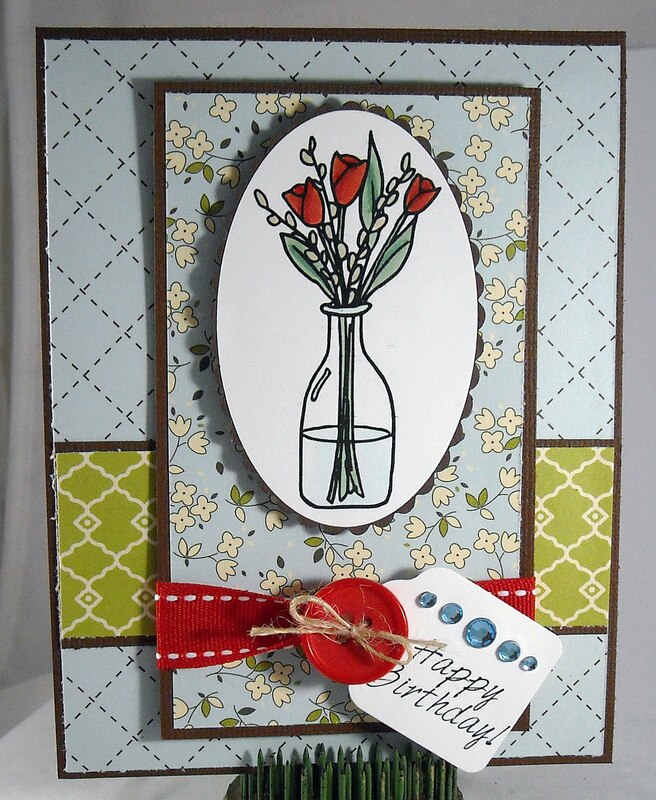 Let me introduce you to the Smell the Flowers stamp set, which contains this sweet rose and vase image along with six sentiments for just $11.00! And I love how Korin has included the perfect sentiments for this set; Happy Mother's Day, Best Wishes, and other friend-related sayings....a wonderful pairing for a vase full of flowers. I paired my image with some fun Jillibean Soup paper, rhinestones from Little Yellow Bicycle, and a happy birthday tag. Oh, button and ribbon are from Papertreyink. Enjoy and be sure to stop by the Sweet 'n Sassy web site to see all of the new releases!! Umm...humm...cough...cough...ok, today's card maybe isn't all that simple...but the truth is...I haven't been in the studio much this week to create a really simple card so...let's go with this one and we'll just call it the "keep it Sunday" card. 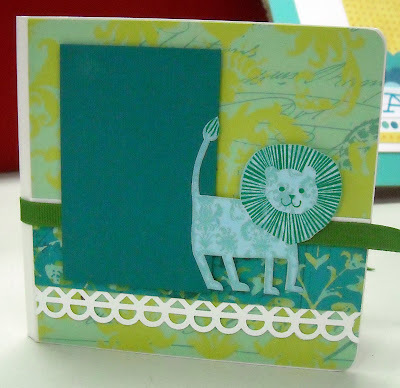 :-) This is a card I demonstrated at an embossing/die cut class this past week. 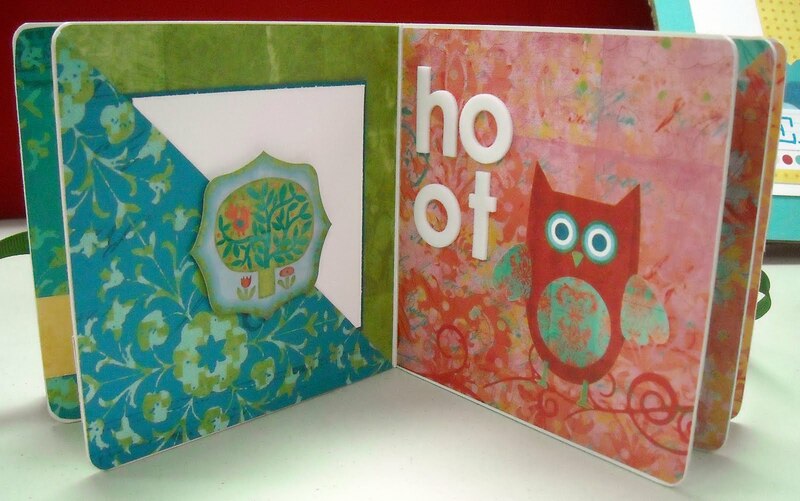 As you might have guessed this card showcased the joy of embossing folders. I adore embossing folders, they do quickly and easily add so much dimension and design to a card. For this card, I started by embossing the turquoise paper with a swirl folder, giving me that beachy-wave feeling. I next embossed a piece of kraft cardstock with the bubbles folder and then created "sand" hills by tearing the cardstock. Adding a bit of Distress Ink to the edges created better definition between the hills. Once those two items were attached to my card base I simply (see it is simple!) had to add my wee crab (isn't he cute??) to the front. Mr. Crab is holding a sign with a sweet sentiment from Papertreyink. I used a 1 3/8" and 1 1/4" punch to create the sun. Humm...so maybe today's card wasn't all that complicated after all!! I hope you enjoy and have a very blessed Sunday!! Morning everyone and happy Friday!! 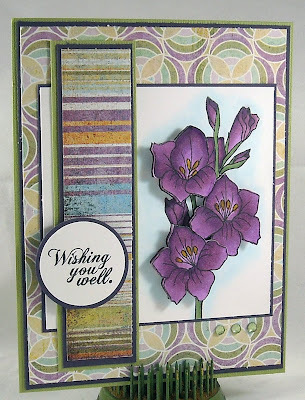 Today, I'm thrilled to be sharing a card on the Sweet 'n Sassy digi blog, showcasing a recently released image from the brand new Gladiola stamp set. This beautiful set is part of the monthly floral sets that Sweet 'n Sassy has been carrying since January.... You can read more about my card on the digi blog! Enjoy! A few weeks ago some stunning papers arrived in the store, straight from Creative Imaginations. The papers are baby themed but are so versatile that they can work for any kind of project. 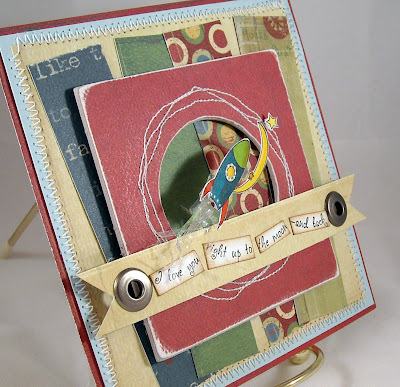 I fell in love with the bohemian feel of the papers...very aged and vintage with these bold bright colors. Well I just couldn't help myself...I went home with paper from the entire line! Ah, the joys of working in a scrapbook store!! I then picked up a little board book, which we sell in a variety of sizes. They're great little books that are perfect for quick projects. Super easy to cover (this size is 5" x 5") and heavy weight enough that you can sand the edges for a perfect finish. The line also came with a 12x12 sheet of cardstock weight stickers. Page 2/3 sported a cute owl and decorative circle images. And here are two sweet tags...I just added a button and some twine. On these pages I added some American Crafts foam letters along with another sticker. How about that owl image? It's printed right on the paper. I wouldn't even consider covering it up...it's that fabulous! Ms. Owl deserved a page all to herself! This is the boy-themed paper, complete with helicopters and another paper that showcases whales. Only added some more foam letters and a sticker for these pages. Here are the last two pages...I've only added a few cardstock sticker tabs, and a few rhinestones for just a hint of bling. Hope you enjoyed today's non-card project! 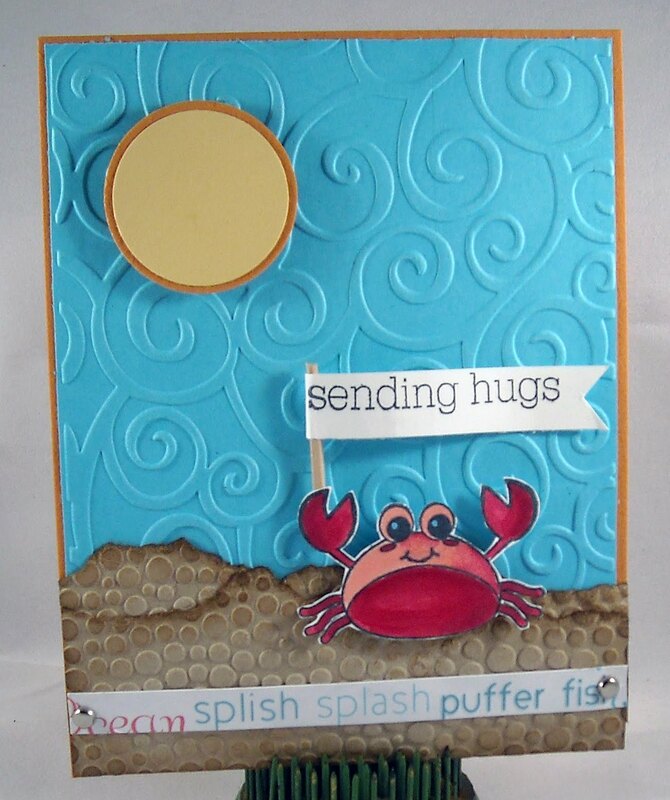 I'm off to work this afternoon along with a class later tonight..We'll be making the cute crab card that I shared on Monday - yeah!! Honestly, I shudder to even think about Fall...I'm not even close to being ready for cooler weather, even when we're in the midst of a summer that is so hot it's hard to be outside for too long. I adore summer weather...I love being in the pool, running around with my hair in what is now a teeny-tiny ponytail, wearing sun dresses and going barefoot, eating far too much ice cream...what's not to love! However...Fall is bound to arrive and in celebration of cooler weather Sweet 'n Sassy recently released a brand new Cocoa stamp set, Autumn Lovin' Cocoa. This sweet set comes with two Cocoa images and four sentiments for only $11.00! I choose to go with the apple Cocoa image so that I didn't have to delve into the whole Fall thing too deeply. ;-) I colored Cocoa with Copics and then stamped my sentiment right in the middle of the apple. 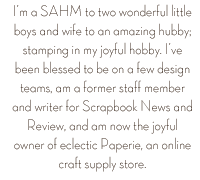 My paper is from s.e.i....a retired line but some we still had lying around the store. I added a few silver brads to either side of my Cocoa image...oh, don't see silver? That's because I colored them with my Copics! How fun is that! Now my silver brads match my cardstock perfectly! Yeah!! 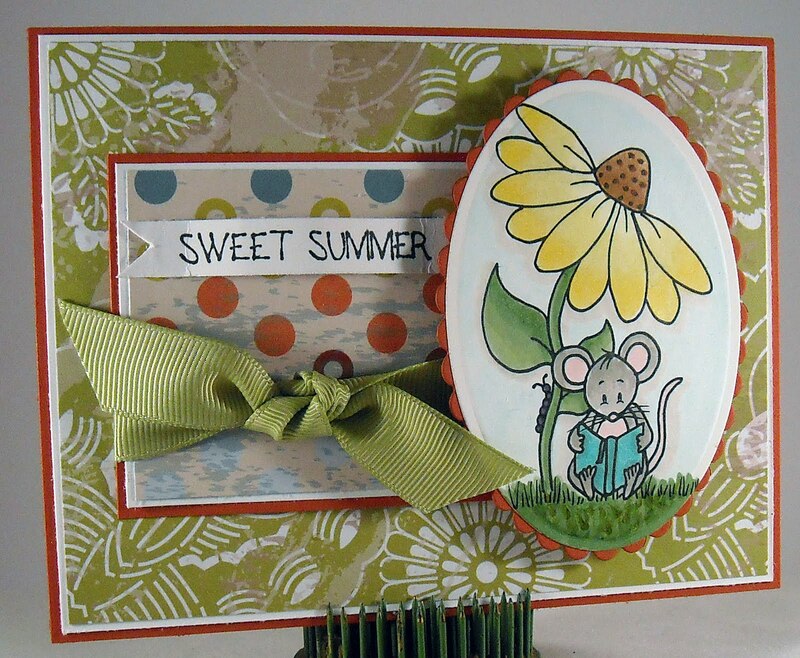 Enjoy and hop on over to the Sweet 'n Sassy web site to see all of the new releases! Greetings!! Let's see if I can get back into the swing of regular posting again... :-) It was fun to take a break from blogging and the computer last week but it also feels kind of nice to get back to a regular schedule. And I couldn't wait to share this card that I made last week when a friend of mine came over for a day of creating. I have a Wholly Scrap! class coming up this week where we'll use different punches and embossing folders. 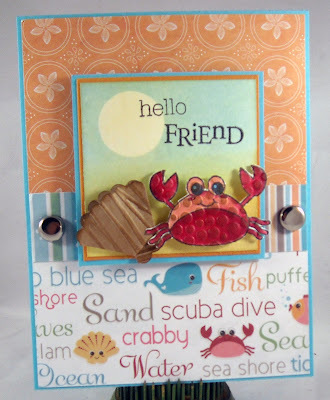 For this card, I stamped this sweet crab, from Imaginisce and colored it with Copic markers. I then ran it through an embossing folder for a little bumpy texture. A hint of Distress Ink across the top of the crab better highlighted his bumps. 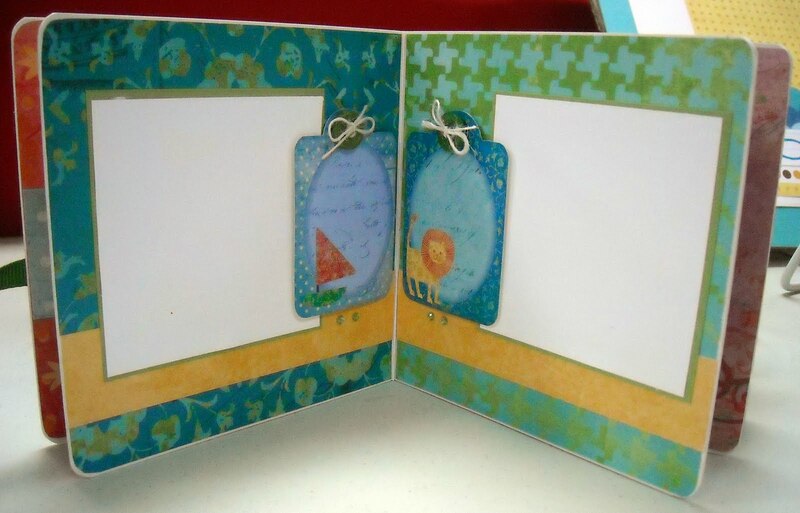 I made the fun shell by using a Marvy scalloped circle punch to cut out the shape before embossing it with a folder. To create the shell shape, I folded the circle in half and cut off a few of the scallops from each side of the half circle. I glued the edges together and worked with the paper until I got the right shell shape. I used the scalloped portion I cut off of the half circle to create the bottom of the shell. Does that make any sense? LOL! I think a picture tutorial may be in order... 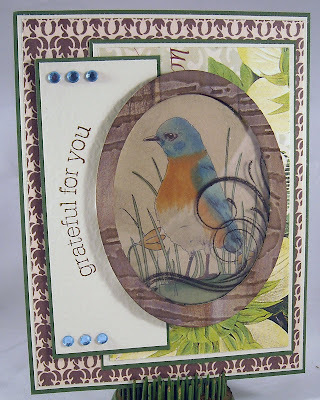 I created the small background by sponging on some Distress Ink around a punched circle. The sentiment is from Papertreyink and all of the fab beach-themed paper is from Imaginisce. Enjoy!! It's time for another Tiffany Doodles challenge!! Did you participate in the first challenge last month? Did you know that you have an opportunity to win oodles of free digis if you play along with our challenges? And you get to visit our design team's blogs to see their lovely creations...What's not to love!! 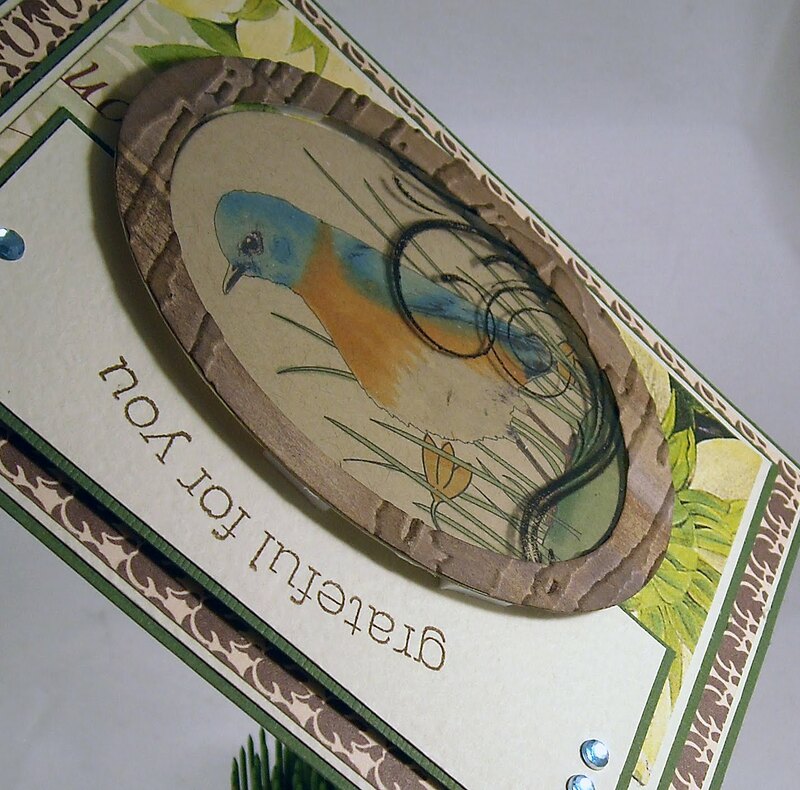 This month our theme is "birds and windows" so you'll need to create a card using a bird and a window, however you interpret that to be!! You may use any stamp you like for these challenges but Tiffany does have all kinds of bird and window stamps if you'd like to download a Tiffany Doodles digi for your card! She also has tons of freebies for inspiration! Here are the rules of the challenge: Start date: Today, July 7 End date: July 31, Midnight EST Winners Announced: August 1 You have 3 weeks & 3 days! GO! Don't forget to add your card to the Tiffany Doodles Flickr Gallery! Tagged with: TD02 The Prizes! You have 4 chances to win up to 7 digis of your choice from Tiffany Doodles! 1st place - 7 digis 2nd place - 5 digis 3rd place - 3 digis 1 Random - 3 digis And now for the details on my card....I used this sweet Bluebird image, available for $2.50, for the challenge. I printed out the image onto kraft cardstock and then colored the bird with Copic markers. I created my "window" by cutting out a frame using Nestibilities dies. I then ran the window frame through one of the new wood grain embossing folders from Tim Holtz. I also cut out a piece of acetate to act as the front of the window. 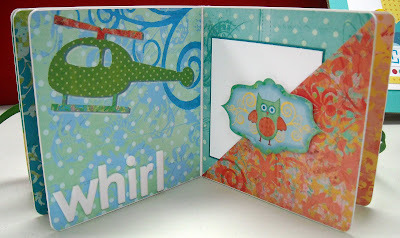 I also stamped a swirl, from Papertreyink, onto the acetate. The window frame was attached on top of the Bluebird image using foam tape. My designer paper is from my stash and I confess that I'm not sure of the manufacturer. For my sentiment, I grabbed an acrylic one from Papertreyink and bent it so that it followed the line of the frame. The blue rhinestones are from Little Yellow Bicycle. Want to see what the rest of the team came up with? You're in for a treat, their designs are amazing! For details on any of the team cards just click on their name to visit their blog! Tiffany Cammy Cindy Deirdre Donna Julie Lindsay Peet Ruby Shannon Vanessa Virginia Enjoy and be sure to stop by the Tiffany Doodles site to enter your card into the prize drawing!! 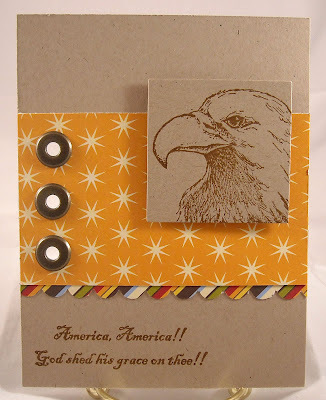 How can I not share a 4th of July inspired card today!! This is a card that was published in Scrapbook News & Review over a year ago but it's just right, for not only for today's holiday but as a Keep it Simple card! 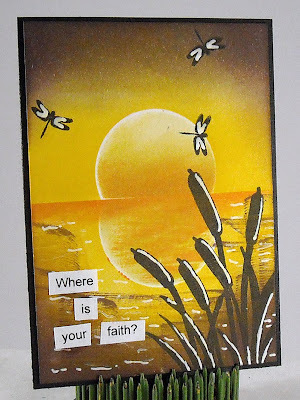 The image and sentiment are from Our Daily Bread and the papers are scraps that I had in my stash. The giant eyelets are compliments of SU! Super easy card, only one ink color! That has to be some kind of record! **wink** Enjoy and wishing you a blessed 4th! How is that for the name of a fancy stamping technique? Isn't it fun! This is one of the techniques that I'll be teaching at a Wholly Scrap! class next week. And I'm excited to report that we'll be using and selling a soon-to-be-released Sweet 'n Sassy stamp set! That's right...You can now get Sweet 'n Sassy stamps at a few select stamp and scrapbook stores! WooHoo!! (I'll share more details on the release next week so stay tuned....) So...this technique...it's super easy and a great way to make your own designer paper. Here are the steps. (You'll need three alcohol inks, two pieces of glossy cardstock, a spray bottle, and paper towels) 1) Gather three alcohol inks, I used Ranger inks, in coordinating colors (using a light, medium, and dark shade is best). 2) Begin dropping the alcohol ink , one at a time, on to only one piece of cardstock. (Start with the lightest ink color.) 3) Use the spray bottle to spray both pieces of cardstock (the plain one and the one with the ink), spray at least two times. 4) Now smash the two pieces of paper together! (OK, smash is a strong word...you can just place one piece of cardstock on top of the other.) Do not smoosh the paper around or your colors will get muddy, just gently push them together. 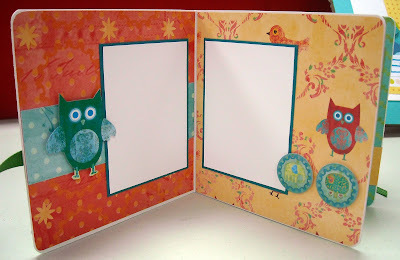 5) Peel the pieces of paper apart to reveal the fabulous designs! (Allow paper to fully dry before using. A heat gun can speed up the process.) I loved the way this background came out...kind of looks like a sunset, no? 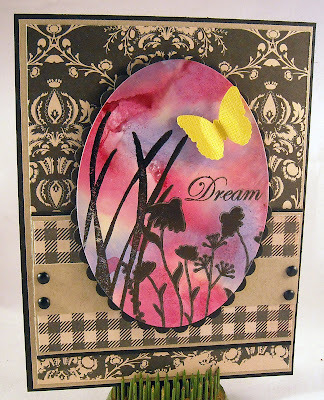 It was the perfect backdrop for these pretty silhouette stamps! 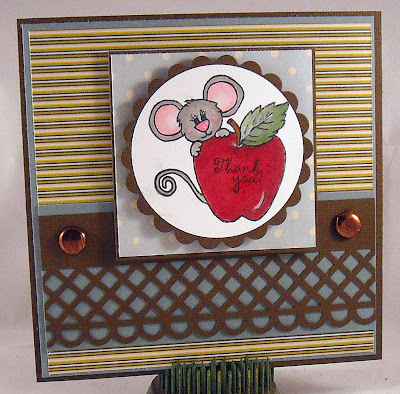 Since my background was so colorful, I opted to stay with a monochromatic card, using only black and kraft. This is more of that fabulous Ruby Rock-it paper, which is my paper of choice for the class next week. 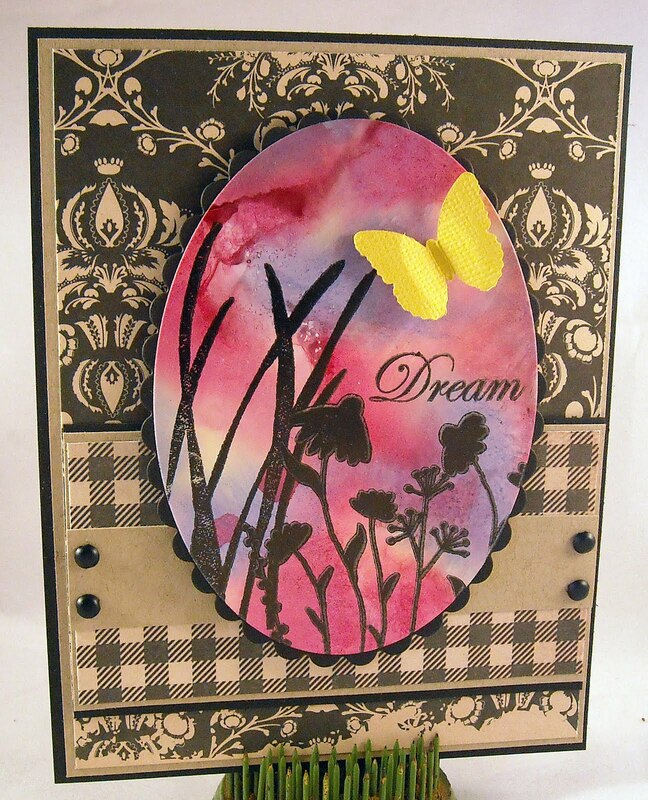 I finished off my card with a bight yellow butterfly punch, from Martha Stewart. Fun stuff! Enjoy and have a wonderful weekend! !